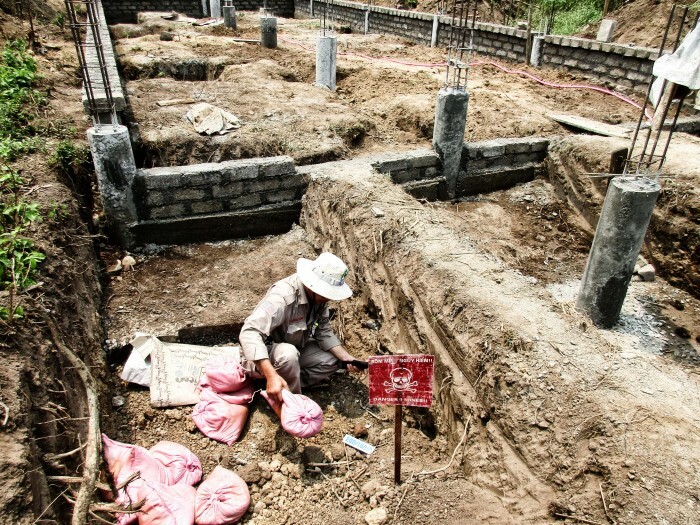 EOD Team Leader preparing for demolition of the cluster bomb unearthed by bricklayers while building the foundation of Mr. Mai Chiem Huu ‘s house. Cam Lo, Quang Tri (28 April 2016) – A cluster bomb uncovered by local bricklayers who were building a new house in An Hung Village of Cam Lo Townlet was destroyed in place by an EOD team managed by RENEW last Friday. Reassured bricklayers resumed their work after the team left. 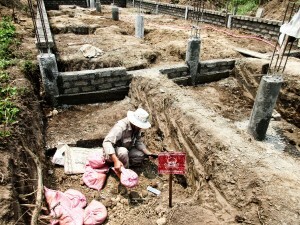 When Mai Chiem Huu, owner of the house under construction, told neighbor Nguyen Trung Hieu about the discovery of the bomb, Hieu immediately urged Suu to call the provincial hotline number and report the emergency. Hieu just last month reported three cluster bombs he discovered while building a fence around his house. Those bombs were also safely destroyed. Located along the Route 9, Cam Lo Townlet covers an area of about 10 million square meters and has a population of 6,200 inhabitants. During the Vietnam War, this area was once the location of Cam Lo Combat Base of U.S. Marine Corps. It formed one corner of what became known as Leatherneck Square, with the other corners being Con Thien, Firebase Gio Linh and Đông Hà Combat Base. Between 1968 and 1972, Cam Lo Townlet was subject to heavy aerial bombardment and fierce ground fighting. 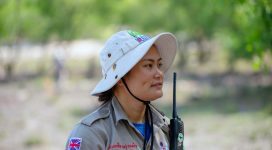 From 2008 up to now, UXO discoveries reported by An Hung villagers to the project’s hotline number have triggered 89 successful EOD quick responses, resulting in safe removal and destruction of 111 items of unexploded ordnance, 50% of them cluster bombs. EOD quick response teams are always on alert to move quickly and dispose of unexploded ordnance found by local people during their daily activities. At the same time, RENEW’s 21 Cluster Munitions Remnants Survey (CMRS) teams are working throughout the province to identify and confirm areas of land that are contaminated with cluster bombs and other UXO. The contaminated land known as Confirmed Hazardous Areas (CHAs) is mapped and entered into the Database Unit of the Provincial Legacies of War Coordination Center (LWCC), which then tasks available clearance NGOs to clean up those CHAs. 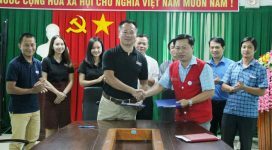 With support from NPA, RENEW’s primary partner, the provincial government of Quang Tri recently established the LWCC to coordinate all post-war mitigation efforts involving NGOs and government agencies. Map of Confirmed Hazardous Areas that need full clearance in Cam LO District. 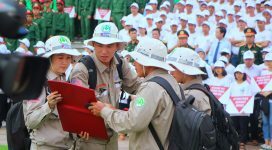 According to Mrs. Nguyen Thi Dieu Linh, NPA Ops Manager at Project RENEW, CMRS land release enables Quang Tri province to adopt a proactive mine action approach, which is faster and more cost effective. 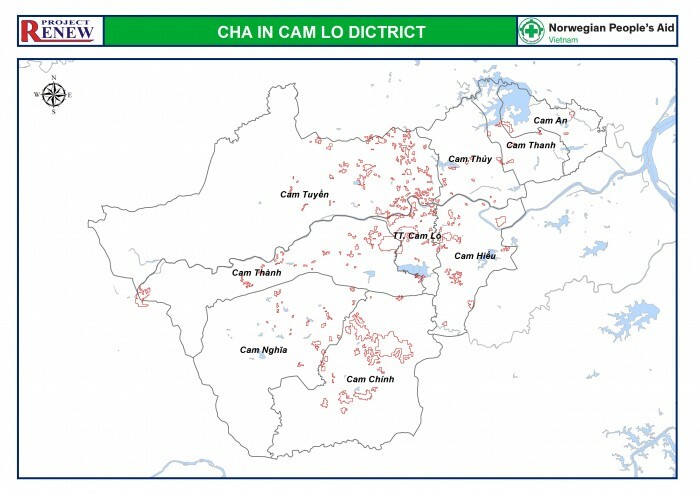 So far, Project RENEW’s CMRS teams have identified more than 30 million square meters of contaminated land in five districts of Cam Lo, Dakrong, Trieu Phong, Hai Lang and Vinh Linh. A total of 11,200 cluster bombs and other unexploded munitions have been found and safely destroyed.